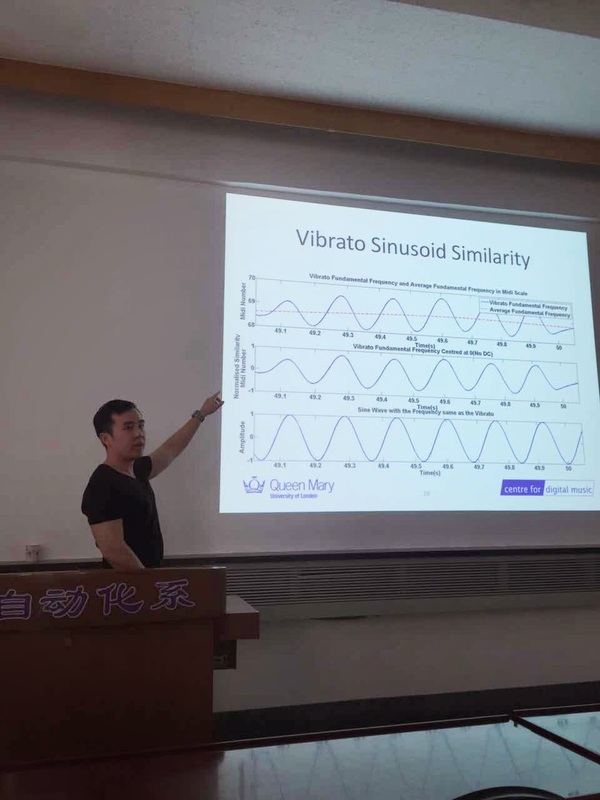 Luwei Yang gave a talk on AVA, an automatic vibrato detection system, at Tsinghua University’s Department of Automation in Beijing, China, at 3pm on Thursday, 5 March 2015. This is the first Centre for Digital Music talk at Tsinghua University. 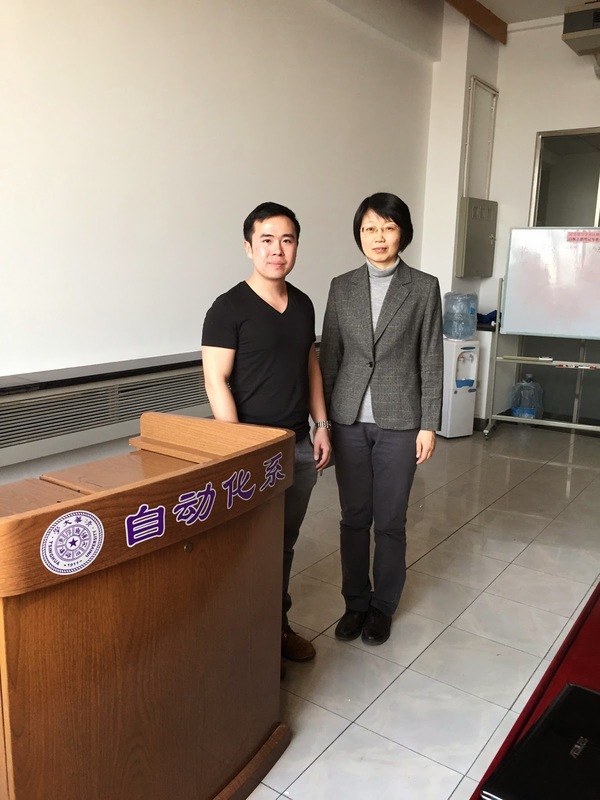 The talk was hosted by Professor Cao Li. See details below. Abstract: Performers can invent diverse interpretations of the same piece of music. For scripted music, the differences lie in the expressive dimensions. We focus on one such dimension, that of vibrato. Vibrato is the systematic (and periodic) variation typically of musical pitch. We present a method for automatic frame-wise vibrato detection and analysis. A vibrato detection system providing end-to-end processing from audio signal to characterization of vibrato properties will be described. The system employs a novel vibrato detection technique using the Filter Diagonalization Method (FDM). Distinct from the traditional Fourier transform, the FDM’s output remains robust over short time frames. Vibrato existence is determined using one of two decision methods—Decision Tree and Bayes’ Rule. When vibrato existence is confirmed, the system then extracts the rate, extent, and sinusoid similarity parameters for the vibrato. Next, we show results of comparisons with state-of-the-art frame-wise vibrato detection methods that are performed using an annotated monophonic dataset consisting of string, wood, brass, and voice excerpts. Biosketch: Luwei Yang received a BSc (first class) degree in e-Commerce Engineering with Law from the Beijing University of Posts and Telecommunications in 2012. He is also an accomplished erhu player. Luwei is currently pursuing a PhD degree in Electronic Engineering at the Centre for Digital Music at Queen Mary University of London (QMUL), under the supervision of Dr. Khalid Rajab and Prof. Elaine Chew. He was awarded a PhD fellowship from the China Scholarship Council in 2012 and his doctoral research focuses on computational modeling and automated analysis of expressive music audio. Luwei was a member of the organizing team for the recent Mathemusical Conversations international workshop in Singapore, and he serves as the Communications co-Chair of the International Conference on Mathematics and Computation in Music to be held in London at QMUL in June 2015.